When I was a teenager, I had the chance to visit Colonial Williamsburg, a living history museum in Virginia. I loved it so much that the Bear and I went back on our honeymoon years later. It was just as good as I remembered and I really hope to visit again someday. One of my favorite things to see on both visits was the pewter collection. Pewter goods were important staples of colonial American life, with everything from dishes and cups to candlesticks and utensils made from this versatile metal. Pewter was a symbol of prosperity and a source of pride for many colonial households. I was surprised to learn that pewter was in use long before the colonial era. It actually goes all the way back to the Bronze Age. There were pewter-making guilds in France by the 12th century, and in England by the 15th. This helped control the way different grades of pewter were used, usually having to do with whether they came into contact with food or drink. Pewter is a metal alloy comprised mostly of tin. It may also contain copper, antimony and bismuth. Historically, it often also contained lead. Pewter arrived in New England in the 1630's, and soon became very popular among the American colonists. Pewter articles are usually made by casting molten material in a mold, or by turning solid material on a lathe. American pewter is more rare than English because demand was very high in America, and pewtersmiths were often forced to melt down old pewter for recasting, or to repair broken pieces of old pewter to make new ones. Pewter was highly valuable; between 1720 and 1767, the value of pewter brought into America was greater than that of all silver, tinware and furniture imported during the same period! 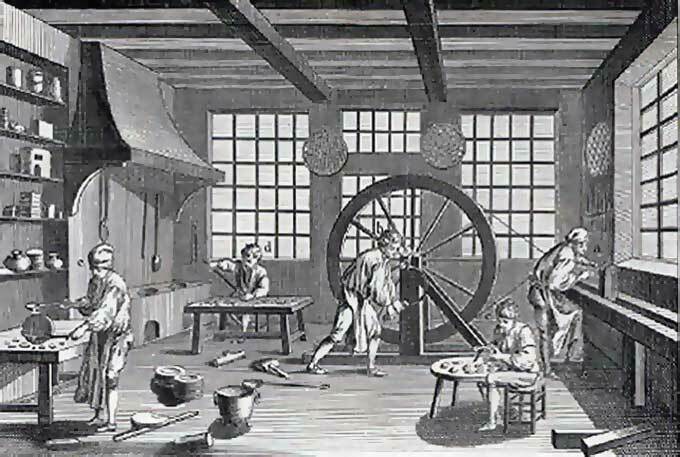 Three hundred tons of pewter came into the colonies during the 1760's alone. Porcelain (or "white ware") would soon take over the housewares market in the colonies, but for a few decades, pewter was all the rage. You can see why. 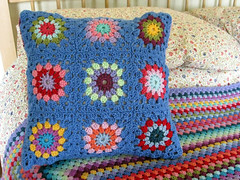 It's durable and can be cast in intricate designs. It can be engraved or carved. 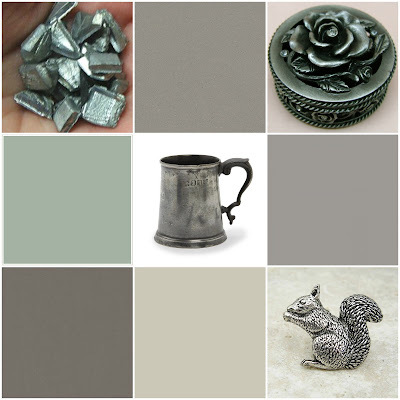 The colors of pewter never go out of style, it seems. 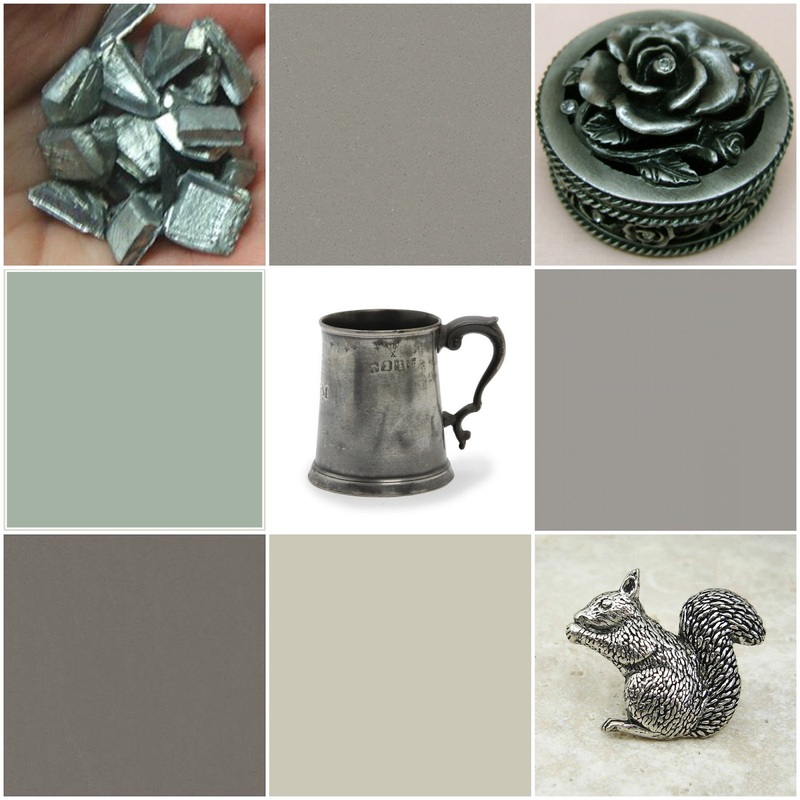 Stand in front of any paint-chip display and you'll see a wide range of gray-based shades that bring to mind the look of aged (or new) pewter articles. One of Benjamin Moore's most popular paint colors is Revere Pewter, a light silver-gray shade with a name straight out of colonial history. Pewter can be darkly tarnished or polished to a bright sheen. 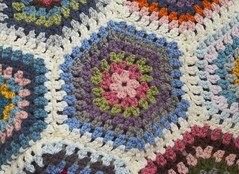 Its tones can be warm or cool, deep or pale. Pewter tones can be seen in home textiles, conveying a sense of depth and calm. I'd like it for couch upholstery, with brightly-colored accent pillows and a light-colored rug. It would be good for draperies too; I think the shantung material in the top fabric swatch would look very elegant on tall windows. Pewter is currently a popular shade in fashion as well, especially for bridesmaids' gowns and prom dresses. 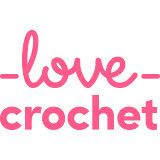 The color is everywhere, on bridal websites and Pinterest boards devoted to weddings. My bridesmaids wore the sugar-icing pastels popular at the turn of the millennium, but today I can see pewter tones on a bridal party; it's like black, but softer, more understated. As metals go, I think pewter is more interesting than silver; the color is deeper and somewhat variegated, and it has a ruggedness that I appreciate. I think pewter may have been somewhat like the Tupperware of its time, but that's one of the things I like about it. Pewter is real household stuff, handsome and historic. I learned a lot about pewter from Colonial Sense, the Website for All Things Colonial (it really is!). A really interesting post. I am suprised that the use of pewter went on for so long. I knew that it was in use in the 15th century here. Love the look of pewter, my husband has been collecting English pewter tankards for years and I have a collection of pewter teapots. This was a very interesting post. I wonder if tin from Cornwall was used in the manufacture of American pewter? I love the colours above. Pewter always makes me think of the sun shining on wet pavements after a storm for some reason. This was fascinating though, thank you. Another fascinating CC post - what an educational and interesting meme this is. My son rescued a half pint pewter tankard from my parents' house which may otherwise have been jettisoned and I'm so glad when I see it on his dresser. When we were on our honeymoon in Wales I bought a small pewter cask in which I keep locks of hair from my babies. It sits beside my bed and although the base is still shiny the hand embossed lid is becoming dull with the passage of time. It is one of my most special things. We went to Colonial Williamsburg about 8 years ago and really enjoyed it. We are planning to paint our living room soon and guess what color we have chosen? Revere Pewter! I love the colour and imagine a stunning accent wall painted in that colour with some pewter accessories a east for the eyes. What an interesting post. It must have been fascinating visiting Colonial Williamsburg, and obviously very enjoyable since you visited a second time. Silver isn't my favorite but I do like shiny silver jewelry and I saw a really cute dress in the window of a shop in the mall that was grey and ADORABLE (silvery)! I hope you are enjoying the weather this weekend, Jennifer! A fascinating post, Jennifer. I really enjoyed it. 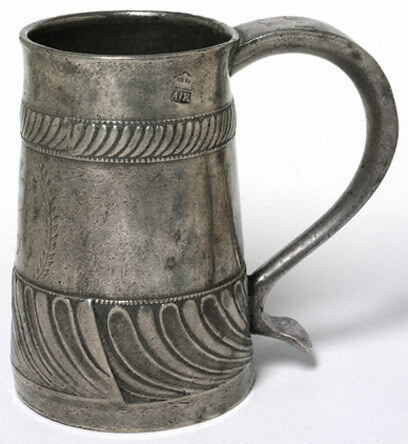 Pewter was a staple for house ware for centuries her in Britain and old pewter is highly sought after by collectors. Like you I like its subtle shades.